I heard one uniformed officer, I think the sheriff, specifically said they were NOT carrying, and I think he had a reason/amplification but did not pay attention. That doesn't make sense to me...a cop is never really off. If they are at a bar drinking.....should they still be carrying? I don't know that much about off-duty carry policies but some departments require it and some don't. Some off-duty carry isn't allowed, like at NFL games. I think a lot of cops might make the choice based on circumstance i.e. is the activity likely to be where a threat occurs? That bar in Thousand Oaks is considered "wholesome" as far as bars go and that community is one where people sleep with their doors unlocked and their windows open. College night and line dancing was probably considered as low a threat as possible even though it turned out differently. My guess is that if an off-duty officer is anywhere with their family, they carry if it's allowed. Glock 21 was used and standard mag sold with it is a 13 round mag. I’m just reporting what I heard. There's a woman who survived this and the Las Vegas shooting. "He used a handgun. Dean said that officials found a Glock .45-caliber handgun at the scene. The weapon usually holds 10 rounds and one in the chamber, but the gunman used an extended magazine in this shooting, Dean said." -Depends on the module of the Glock... fulls sized Glock 21 and 41 is 13 rounds, the small size compact and subcompact Glock 30 and 36 are 10 and 9 rounds. I do believe you can interchange the mags and there is a 26 round mag that would fit most of these from a third party manufacturer. "There were six off-duty officers from various agencies inside the Borderline Bar & Grill at the time of the shooting, Ventura County Sheriff Geoff Dean said. Dean said a mother recalled that the officers stood in front of her daughter to protect her." -Did any have a pistol on them and shoot back? 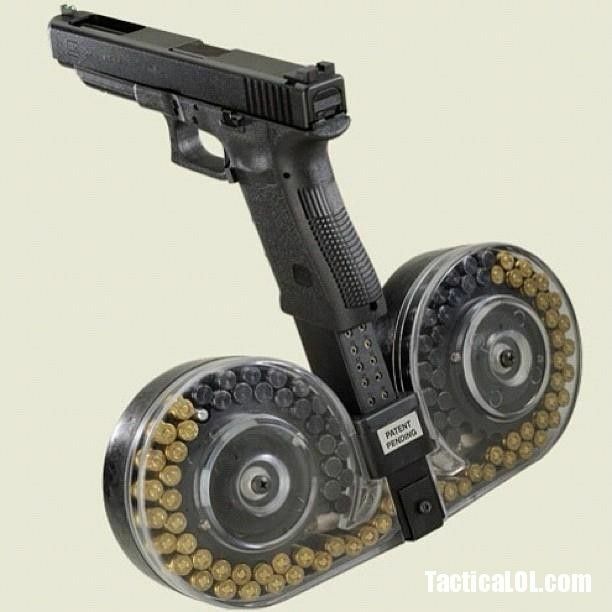 You can buy 100 round mags for any glock. Glad that dirt bag didn't have one.